There are many types of angels living and working in the spiritual dimension. But not every angel looks like a human being. For example, the cherub angels look nothing like a human being, in fact, there is nothing on Earth that looks like a cherub. The Prophet Ezekiel informs us that a cherub is a hybrid being–it has four faces: that of a man, an ox, an eagle, and a lion. They also have four wings, the hands of a man under their wings, and feet resembling the sole of a calf’s foot. Furthermore, they also sparkle like the color of burnished (polished) brass and burning coals of fire, and they also send forth fire and lightning (Ezekiel chapters 1 and 10). Many people have the mistaken impression that Satan looks like a human man, however, according to the biblical texts, Satan is a cherub; in Ezekiel 28 there is a shift from the description of the earthly prince of Tyre to an angelic being called the King of Tyre. The description could not apply to a human because he is called the “Anointed Covering Cherub” who was in the Garden of Eden (Ez. 28:13). According to Genesis 3, there were only four beings in Eden–God, Adam and Eve, and a serpent or Nachash. The text in Ezekiel goes on to state that “Thou art the anointed cherub that covereth: and I have set thee so: thou wast upon the holy mountain of God; thou hast walked up and down in the midst of the stones of fire. Thou wast perfect from the day thou wast created, till iniquity was found in thee (Ezekiel 28: 14-15). It is an intriguing fact that Satan looks nothing like a man in his natural state. That state is now fluid because of his fall from grace and perfection. Now, he is a schizophrenic being and usually appears as something other than what he actually is. Now he may appear as a human man if that appearance will accomplish his deceptive work. However, according to the Bible he usually manifests before mankind as a “roaring lion” (1 Peter 5:8), and at other times as a beautiful “angel of light” (2 Corinthians 11:14). But in the end he is a fallen cherub and an inner burning in the midst of his being will consume and devour him (Ez. 28:18). At the end of the age he will be cast into the abyss, and 1,000 years later, he will find his end in the lake of fire with the Alien Antichrist Beast and the False Prophet (Rev. 20:1-3, 7-10). Another type of angel are the messenger angels who do appear to look like a human man. Abraham had three visitors: one was the Lord (a pre-incarnate appearance of Jesus Christ), and the other two were angelic men. 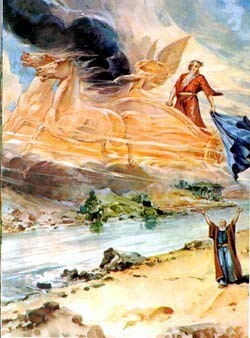 The Lord left after his conversation with Abraham, but the two messengers angels went to Sodom to see Lot. These angels attracted the attention of the wicked Sodomites of the city, and so the angels struck them blind so that Lot and his family could escape before the judgment of God fell upon the cities of the plain (see Genesis 18). It is interesting to note that the angels had bodies just like a human man, and Abraham washed their feet, and they also ate the food that was set before them. The chariots of God are twenty thousand, even thousands of angels: the Lord is among them, as in Sinai, in the holy place (Psalm 68:17). Gill provides a biblical reference which is 2 Kings 2:11, referring to Elijah’s ascent into heaven. According to the text it would appear that the chariots of God is either a type of angel, or a supernatural mode of transportation between heaven and Earth for angels! Just reading these verses I am intrigued with the possibility that the Chariots of God are a type of angelic vehicle. Is it possible that the fallen hosts of Satan who dwell in the atmospheric regions around the Earth also have access to these flaming chariots? Are the authentic UFOs that suddenly appear in our skies the spiritual chariots of the fallen heavenly hosts that are manipulated to look like a round or oblong saucer-shaped craft (after all, the fallen hosts have the ability to manipulate tremendous amounts of energy and matter for a short period of time when they appear in our dimension. If you would like to learn more about the many different types of angels and how they act and react in our dimension of time and space then I recommend my book to you, Alien Antichrist, The Terrifying Truth about UFOs and Aliens, Antichrist, and the End of Days. The book is an in-depth study of the last days revealing that the Antichrist is very different from what you may have heard about elsewhere. I document in the book that the Antichrist is not a human being but a fallen angelic king who ruled the world during the days of Noah. In fact, the Bible reveals that he is coming back to Earth to rule as a king once more, a kingdom the Bible calls Babylon the Great. If you are interested in Bible prophecy then get the book and you will never look at Bible prophecy in the same way. This is vital information that you need, because once official alien disclosure takes place the flood gates of evil will swing wide open and a deadly spiritual tsunami is headed our way. Painting of Elijah and the Fiery Chariot public domain at Wikipedia. 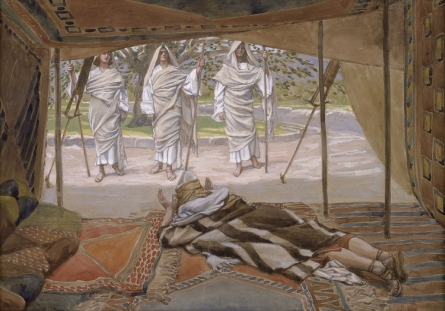 “Tissot Abraham and the Three Angels” by James Tissot – http://www.thejewishmuseum.org/onlinecollection/object_collection.php?objectid=26696&artistlist=1&an=James Jacques Joseph Tissot. Licensed under Public Domain via Wikimedia Commons. 1. Dr. John Gill, Gill’s Exposition of the Entire Bible, comments on Psalm 68:17. 2. Gesenius’ Hebrew-Chaldee Lexicon, comments on Ps. 68:17, Hebrew ‘esh (Strong’s H784). 3. Keil and Delitzsch Commentary on the Old Testament. 4. Jamison, Faussett, Brown Commentary.